A gladiatorial fight would usually involve two gladiators but similar types of gladiators such as the Andabatae, would not normally fight each other. Gladiators were usually clothed to resemble barbarians with unusual and exotic weapons and their fights depicted famous victories over barbarians and the power of the Roman Empire. What type of gladiator was a Andabatae? What weapons and armor did they use? What was their style of combat? And what type of gladiator was matched as their opponent? - Definition: Sight Restricted Gladiators. The Andabatae wore helmets without any aperture for the eyes, so that they were obliged to fight blindfold, and thus excited the mirth of the spectators. The Andabatae were not the usual gladiators who had been trained in one of the Gladiator Schools - they were the noxii who had been sentenced to death in the arena. These were hapless criminals who provided comic relief to the audience. They wore helmets without any openings for the eyes. They fought completely blind, manoeuvred closer and closer together by arena attendants, lashing out and slashing blindly at each other. These fights would have been fought for the amusement of the crowd. Perhaps as a fill-in to keep the spectators amused. A morning event. Not in the same league as the gladiatorial combats which were the highlight of the day. The Andabatae fought to the death with perhaps the possibility of the 'last man standing' being allowed to walk out through the Gate of Life. Andabatae who fell to the arena floor would be burnt with a hot iron to check that he was really dead. If there were any doubts a Colosseum attendant, dressed as the Charon the ferryman to the underworld, would smash the wounded gladiator on the head with a double-headed hammer. 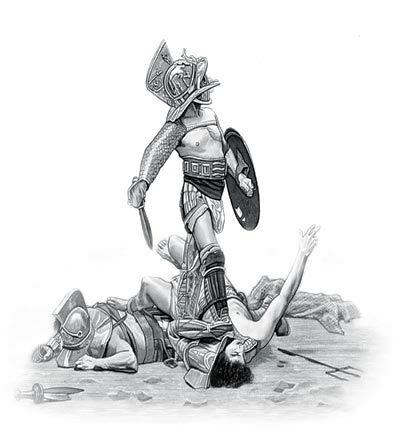 The content of this Andabatae category on the different types of gladiator who fought to the death in the gladiatorial combats staged in Ancient Rome provides free educational details, facts and information for reference and research for schools, colleges and homework. Refer to the Colosseum Sitemap for a comprehensive search on interesting different categories containing the history, facts and information about Ancient Rome. Interesting facts and information on this type of gladiator: their weapons, their armor and their style of combat.